Professionals in Birmingham are being called on to recycle their unwanted workwear as part of a drive to help unemployed people get back into work. The call comes from a collective of young professionals based in the city’s business district who have set up an initiative called Suited for Success. The scheme has been inspired by the belief that helping someone find a smart work outfit will give them the confidence they need to make a positive first impression at a job interview. Run in partnership with Birmingham Central Foodbank, it aims to help unemployed people back into work through the collection and distribution of good quality ‘gently worn’ workwear. The clothing is collected by individual companies and then distributed to people in need through the foodbank’s own Urban Boutique. The initiative was created by a group of professionals who were united by their desire to make a positive impact on the city and Suited for Success was borne out of a recognition that unemployment - and youth unemployment in particular - is a major issue that needs tackling. Laura Holmes, an associate at law firm Wragge Lawrence Graham & Co, is one of those behind it, along with Wragge colleague Lorna Gavin and David Richardson from Lloyds Bank. Explaining how Suited for Success came about Ms Holmes said: “It was set up as something called Project 14, which followed on from another project helping to get people with mental health problems back into the workplace. “We wanted to come up with some sort of initiative that would help Birmingham in some way and went away and thought about it for some time. “We came up with this idea to get gently worn workwear and give it to people who are out of work so that hopefully they can get jobs. In Patricia White at Birmingham Central Foodbank the Suited for Success team found a kindred spirit. “Patricia at the foodbank had been thinking about setting something like this up for some time,” Ms Holmes added. Having done some initial research Ms Holmes and the others decided to set-up a pilot project to see if it would work. The idea was to see if work colleagues would be supportive and to assess the logistics of the scheme. The wheels were set in motion in January this year and Ms Holmes said the overwhelmingly positive response they got inspired them to press ahead. “We had an amazing response,” she said. “It works really well, as everyone has work clothing they don’t use, and collecting them is fairly low maintenance”. “It’s pretty easy to put a box somewhere, put out posters up and say give us your clothes. “The idea is to do a sustainable thing that doesn’t involve a lot of input but works. “At Wragges we have a ‘Suited for Success’ cupboard where people can leave their unwanted clothes. and people just go and put clothes there. Having seen the scheme works the Suited for Success team is now aiming to spread the message and is having a launch event at Wragge Lawrence Graham & Co’s office on May 12. Ms Holmes said: “We’re looking for more organisations to get involved in the scheme. We hope that people will come to the launch, find out more about the scheme and pledge to launch collections in their own offices”. “We can say here’s how you do it, here is the branding - the publicity material and the and posters. “It’s something that is so easy. People take for granted the fact that they have business clothes to wear, but for many people it is quite an expensive outlay which may prohibit them from getting jobs”. “Our aim for Suited for Success to be at the forefront of someone’s mind when they are having a clear out, and instead of thinking ‘I am going to throw this jacket out’ people instead decide to take it into work and give it to Suited for Success. Ms Holmes said: “I think maybe we could look at growing it organically to other parts of Birmingham. 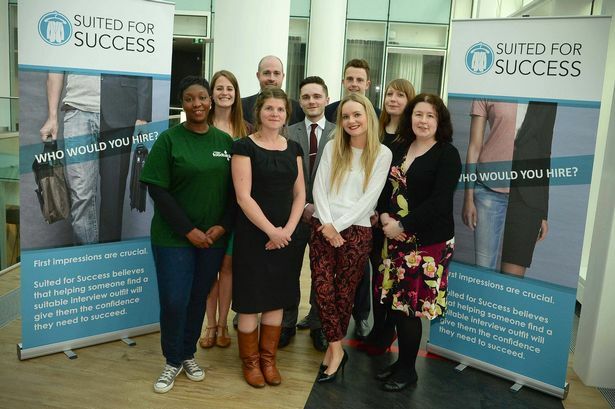 Suited for Success can be contacted on Twitter @suitedforbham and all are welcome at the launch event on Tuesday May 12 at 6pm at Wragge Lawrence Graham & Co’s Two Snowhill office. Anyone interested in attending the event should contact the team @SuitedforBham or email Ms Holmses at laura.holmes@wragge-law.com.